The Old Vicarage and the neighborhood in which it sits has a vast and interesting history. If you live near the Old Vicarage you may find some interesting historical information on this website related to your home or street. Nevertheless, I hope you enjoy what I have tried to put together for your entertainment and my amusement. I would like to invite anyone and everyone to blog me if you feel there are any discrepancies or to provide pictures, insight or knowledge on the subject. When I bought the house in 2009 I was honored with a copy of An Intimate History of The parish of St Clement in Cambridge, 1250-1950. This nearly 1,000 page history book was written by T. E. Faber, but left unfinished. After the death of Tom Faber, the book was organized and a small printing was undertaken by his widow, Elisabeth van Houts in 2006. I have to say that I nearly cried when given a copy; it was a wonderful gift and provided me with insight into my home that few have the opportunity to experience. In addition to Tom Faber's book I found a good deal of information in Walks Round Vanished Cambridge Bridge Street, by Henry Bosanquet that was published by Cambridge History Agency in 1976. This book was found in a bundle of Notes that Tom Faber used to write his book and that Elisabeth van Houts gave to me upon purchasing the house. So a special thanks Lizbeth! I will start the history as far back as I can since our little area of Cambridge is one of the oldest occupied areas of the city, if you discount the evidence of a farmstead on the site of Fitzwilliam College; the remains indicate the site is 3,500 years old with evidence of a Belgic tribe having settled on Castle Hill in the 1st century BC. Nevertheless interesting, we are focusing on Thompsons Lane and its neighborhood, which was commonly known as the bridgeland. In this regard we can safely say that the town of Cambridge was established at the river crossing on Bridge Street over a 1,000 years before the first college was founded. 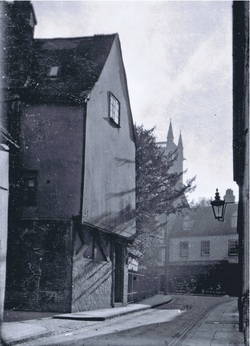 The crossing at Bridge Street was chosen as it was the only passible ford; the land now known as the College Backs, which was once called The Thousand Willows, was a marshland. Cambridge was a river town with an important river port long before any of the colleges were founded and by 1300 AD was one of England's top 20 wealthiest towns, ranked by tax. Quayside was an important dock and many goods were shipped up and down the river Cam. Hay, being an important commodity was one such good, as important as petrol is for our cars today hay was for fueling horses, and the best hay was grown in the Fens and brought upriver to a Haymarket which was held opposite St. Clement's church on Bridge Street. The Jews were vital to the community and to river trade as they were the only people permitted to lend money for commercial ventures. As one of the top 20 wealthy towns in England in the mid-twelth century, Cambridge had the fifth largest Jewry in England after the London, Norwich, Lincoln and Southampton. In 1282, several years before national expulsion, the Jew were expelled from Cambridge, and this started a fast decline of the quays (called hythes) and river trade. Combined with over taxation to fund The Hundred Years War, Cambridge like many great cities in England declined. A sign of prosperity to our little neighborhood was the building of St. Clement's church around 1240. If you look in the south-west passage you can see the stone heads of a merchant and his wife who are thought to have paid for the rebuilding of the church. There were other churches in our neighborhood, All Saints and Holy Sepulchre, but they have not survived. St. Clement's is one of the oldest standing churches in Cambridge. In 1280 Peterhouse, the first college was founded and between 1330 and 1500 ten more colleges were founded. Seven of these colleges were between High Street and the hythes (river docks). By 1500 the only docks surviving the ever expanding colleges were Quayside and Millpool, both now popular punting stations. Bridgeland was the only area in Cambridge that was not infiltrated by colleges, that was until after the reformation and the dissolving of monastic institutions. In 1511 St. John's hospital became St. John's College and in 1542 the Monk's Hostel of the Benedictine Fenland Abbey of Crowland became Magdalene College. With the loss of river trade the now growing colleges began a tight grip on the townspeople by fixing prices and meddling in justice. As a result brewer Thompson, who gave the name to Thompsons Lane was excommunicated by the Chancellor for using a non-university courts of law. Thompson was bit of a fiery character as he bounced back as Major of Cambridge two years later. A good town can't be kept down, and in the 18th century with the golden age of river transport (between 1520 and 1662) Cambridge went from 29th to the 9th most prosperous towns in England by tax. Corn from the Fenland was traded in Bridgeland and this made Cambridge one of England's major corn markets. This was made possible by Queen Elisabeth I who rejected the universities request to limit the export of corn from Cambridge. Bridgeland was a hustling and bustling place and was lined by houses and inns. By the early 19th century there were 31 inns and pubs in Bridgeland. With all this prosperity the merchants paid for the rebuilding of the cancel of St. Clement's in the 1720's which was constructed in red brick. With the arrival of the railway in 1845 Bridgeland started to decline and by 1869 eighty percent of the inns and pubs were gone. Now the major employer in Cambridge was the colleges, which underpaid the towns people and Bridgeland became a poor neighborhood, not unlike most of Cambridge which felt the same affects of the college. Cambridge continues to thrive through the colleges and many lovely independent and high street stores. With students studying at the colleges as well as language schools, cambridge is full of young people. Not to mentions thousands of tourists that bring wealth the city. Thompsons Lane was very different to how we see it today. I am making a stab at the date of the drawing, which I am guesstimating to be between 1928 and 1938. 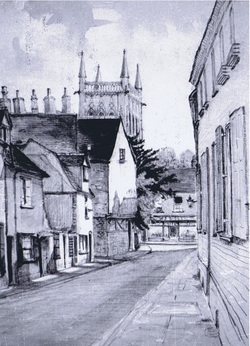 My reasoning is that St. Clement's lost it's spire in 1928 that would have been visible in the drawing. Likewise, the building at the end of the Thompsons Lane was not there after 1938 when Bridge Street was expanded. Actually the current line in the middle of Bridge Street is where the building fronts once stood, that would have made Bridge Street quite narrow. 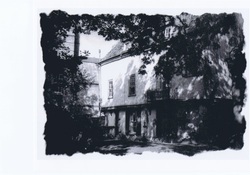 This photograph of the Old Vicarage was most likely after 1936 and before 1938. You can see the outline of an old building at the left of the picture behind the Old Vicarage. I believe this is Nine Pins Court; four of the buildings were demolished in 1911, and a fifth was converted into a wash-house for the community, it is the wash-house you get a small glimpse of. 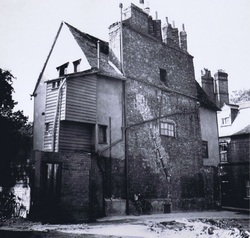 The wash-house was cleared in 1936 and replaced by the Synagogue. All these homes housed the poorer of Cambridge's society at the time. The Victorians were famous for tearing down original Tudor buildings only to replace them with neo-Tudor. You can see the neo-Tudor front on the street side of the Old Vicarage. This front covered an old shop window and was causing structural damage as the building could not breath. Thankfully I was able to have it removed. Just a note, Thompsons Lane was not always named so, before taking its current name it was called Harleston's Lane. This photograph of the Old Vicarage, as above, was most likely after 1911 and before 1936. I am still researching, but believe the houses behind the Old Vicarage on the right of this picture to be Nine Pins Court; four of the buildings were demolished in 1911, and a fifth was converted into a wash-house. 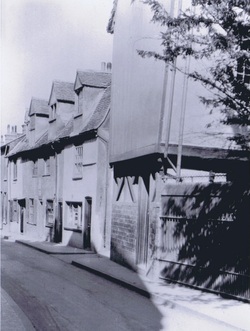 The wash-house was cleared in 1936 and replaced by the Synagogue. In 1890 "the Paddocks" were cleared on Thompsons Lane and Richmond Terrace was built on that site. This is a wonderful picture; I love the way the shadows play across the house. There used to be more trees in the garden, but several have been felled since this picture was taken. There are still a surprising number of trees in the church yard for the center of Cambridge. On the second floor you will see the balcony and the window to the left of that, which is now the dressing room, this window has changed several times. It is thought that in the late 30's the bay window was put in, however during renovation it was found to not be secure, therefore we had a new sliding sash window made identically to the old one for replacement. The Old Vicarage with 'green door' extension, c 1938 from the Cambridge Collection in the Cambridge Public Library. 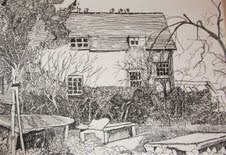 This is a drawing of the Old Vicarage looking over the cemetery of St. Clement's from Bridge Street. It was lovingly penned by Stephen Burton, my husband, for my birthday in 2011. The house was not completed yet, but the scaffolding was finally down and from the church yard, it looked quite civilized.